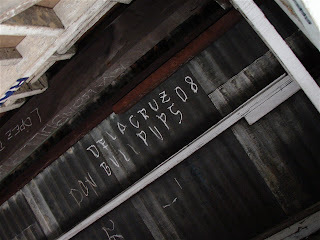 (This appears in my Monday, July 7, 2008 column in the Business Mirror. It begins a series spotlighting different college basketball programs beginning with NU leading up to San Beda, UST, and UP). 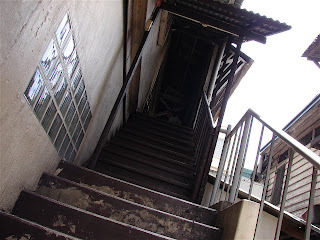 There are exactly 20 wooden and cement steps that lead up to the dingy old gym where the National University Bulldogs practice in Sampaloc, Manila. Yes, it starts out as cement but the higher you go it’s replaced by wood so old that it should be given a senior citizen’s card. The gym, well, there aren’t many like it today as it was built using those old GI sheets dating back to the post-war period. In this digital and internet age, when you say war, it’s either Iraq, Afghanistan, or some hotspot in the flashpoints that are Africa or in the Middle East. The “war” more correctly is the big one that ended in 1945. 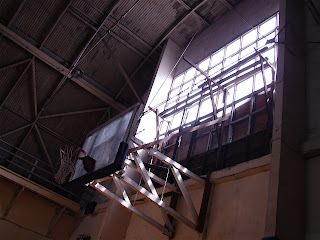 And the gym built atop the Engineering Laboratory of NU has been around since Skip Guinto piloted the Bulldogs to its one and only championship dating back to 1955. Inside the gym there is no championship banner hanging in the rafters to even commemorate that title. 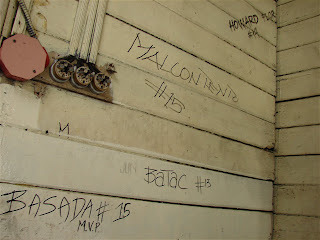 There is no hall of fame to celebrate its athletes so players use your ordinary variety pentel pen to write their names and jersey number on the wooden walls and the GI sheets after having completed their tour of duty with the team. 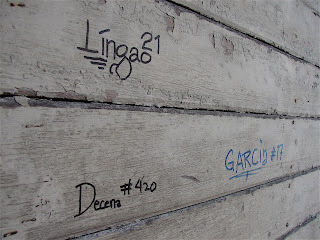 This is how they’ll be remembered forever. It’s easy to fall into the cracks when you’re an NU Bulldog. Chances are you weren’t even high on the recruiting list of other schools. Their players sport names that you won’t find on the jerseys of the bourgeoisie schools -- Lingao Lingao, Malcontento, Cajayon, Grijaldo, and Tugade. Occasionally, they lose a player to a big program like last year’s high school MVP Jovet Mendoza who is now ensconced in La Salle (he was offered a great package, as they say). They feel bad for a moment but only for a moment. While they are used to being the have-nots they have not given up hope. Going to college or even to NU was their chance to move on up in this dog-eat-dog world. Former player, Froilan Baguion, one of the four Bulldogs to make it to the pros (the other three are Cris Bolado, Danny Ildefonso, and Lordy Tugade), is from Navotas and making it to the PBA was his chance to send his siblings to school. At so young an age, he was already his family’s breadwinner. And now he’s trying to hold down a spot with his pro team. The gym. It’s not as storied as the old Boston Garden’s parquet floor but they do have something in common – there are dead spots on the court. You dribble the ball and if you’re not familiar with the court, you’re liable to drive one way and find that the ball has decided to stop in its upward-downward motion or go in another direction. The wooden floor is well-worn with the thousands of sneakers that have squeaked on it. In some places, it’s like the sidewalks of the urban city streets what with the gum shoe drops and stains of water, spit, vomit, and sweat. The water-stained ceiling, made up of those GI sheets leaks when it rains. Practice literally slows to a crawl because the floor becomes slippery, but this isn’t chess so the players try to run. How many people have they lost to injury because they slipped on the wet floor? Last Friday, after the school held its annual cheer rally to send off the team on its UAAP campaign, the players asked their coaching staff if they could all watch a movie. They ambushed school official Bobby Paguia who provided them with some money. The 16 Bulldogs and the coaching staff chipped in a little here and there and they all boarded the LRT to Gateway where they watched Will Smith’s Hancock. “Bonding time,” said coach Manny Dandan. Watching movies and having a Jollibee value meal build character in case you don't know. They’ve got an old school way about things here. Dandan is a throwback where he is the team’s coach and trainer. 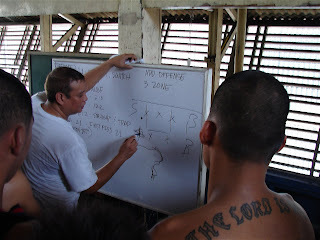 He has three other assistants including former player Jeff Napa who helped lead the team to its last Final Four appearance in 2002, yet sometimes Dandan helps officiate the scrimmages. It’s not that he’s a control freak. They’re not just moneyed as the big college programs. A school official was distributing sports socks to the players – only one pair each – and the coaching staff is not getting any. In fact, they’ve never gotten anything since. “It’s fine,” confirmed the coach. 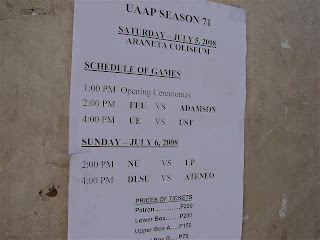 “Sa mga bata muna.” Tickets, scarce already because they’re sharing the same play date as Ateneo and La Salle, are allocated to one per player and when you consider that their parents would like to watch, only one can go. So if the player has a girlfriend then she’s got the ticket. And at best it’s an Upper A.
There’s some hope on the horizon. The SM Group of Companies has become a partner with the school. There is talk of building new facilities in the span of nine months (just as long it takes to build a super mall I gather) not just for the school but also for their athletic teams. Their game jerseys are courtesy of construction man, Jose Aliling. The team was supposed to get an adidas sponsorship, but since the team’s lone star, Edwin Asoro wears Nike they’ll have to wait till next year before the players begin wearing the three stripes. In the meantime, they’re off to Cash and Carry to buy new shoes at a 50% mark down. For now, Jahnke feels truly relaxed for the first time since he transferred from San Sebastian Recoletos high school to NU. The Stags may have a more storied basketball history but it was finding the right environment to be a man. Jahnke knew the school has a good graduation rate for its players and he’d get better one-on-one training from the coaching staff in his growth as a basketball player. “Walang regrets,” he summed up of his time in blue and gold. For now, the senior feels that this current team of Bulldogs have meshed well. Everyone can speak out their thoughts without any trace of ego between the vets and the rookies. Asoro is one of those players who fell through the cracks unnoticed by any recruiter. 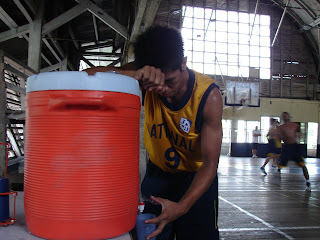 He went to high school in Fort Bonifacio and together with former teammate Jonathan Fernandez, decided to go to NU. It was the only school they went to when looking for a college. Asoro’s coming out of nowhere prompted one legendary coach to ask Manny Dandan where they found him. The coach chuckled and let his counterpart stew on that conundrum. Mystery solved, gentlemen. Immensely talented, Asoro has become a vital cog with the PBL’s newest dynasty, Harbour Centre. Having tasted success elsewhere, he’d love for nothing more than for his Bulldogs to win and get back to the Final Four of the UAAP in his final playing year. It eats at him. The losing gets to the players. Everyone of them. They don’t say that tomorrow is another day and it’s just a game. No. It tears at them. They feel a tad envious of schools with great programs and practice facilities. An errant pass in their gym and the ball is headed down the stairs and onto the street. If you’re not careful with your movement, you might just run into the wooden walls or some of those old and broken down weights that can be found on the side of the court. Welcome to the school of hard knocks, son. Practice is over. The team huddles before the players go off for a shower for the opening at the Araneta Coliseum. There is an air of optimism but they wonder how long it will last. A few of them linger around to work on their free throws and dribbling. “Walang pressure sa amin this year so maybe we’ll play better,” predicted Jahnke. He swishes a three-pointer before he packs it in. In a few months’ time, his name will be scribbled on the walls of that dingy old gym. 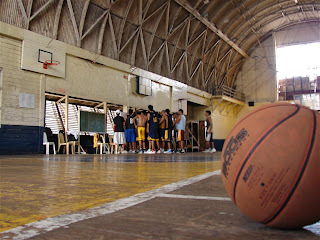 Post script: I'll be writing for the NU Bulldogs on a semi-regular basis and it will appear in their school website. Watching those guys is like keeping it real and old school. It's like expecting Gene Hackman to walk through those doors. On the other hand, the material on the San Beda Red Lions and UST I'm not sure if it will appear in their site though it probably will.